"It would seem your husband is not a deep connoisseur of your soul. Here you have nothing to fear." Perhaps it's something as simple as the Mediterranean climate, but the Italians seemed to have figured out something about the pleasures of life in a manner that their northern European counterparts haven't. (Honestly now: would you rather be a character in a Bergman movie, or a Fellini movie? I'll take Italian absurdity over Scandinavian brooding every time. I'd eat better, I'd have more fun, and I'd be less likely to come to a bad end.) I don't want to travel in cheap and obvious stereotypes about la dolce vita, but day-to-day living in Italy seems deeply pleasurable, saturated in history and good food, in a way that doesn't measure up to most other places I know. And a great swath of that zeal is at the heart of Bread & Tulips, a charming, daffy comedy that was the darling of Italian awards shows in 2000. Licia Maglietta plays Rosalba, housewife and mother of two adolescent boys, from the working-class town of Pescara; the family is on a sightseeing summer vacation in Sicily. (Dad can't help but make stupid remarks, drawing attention to himself and mortifying his sons.) During a tour bus stop at a rest station, Rosalba loses an earring down the toilet in the women's room; when she finally recovers it, she discovers that the bus has rolled on without her. She calls her husband (Antonio Catania), a bathroom supply salesman, on his cell phone, and he's furious with her—they'll have to circle back to pick her up. In a sudden moment of inspiration, Rosalba decides instead of waiting around for her ride to hitchhike back to Pescara; a couple of days away from the family may be the very thing. Inspiration strikes yet again, when she passes by her hometown and sets her sights on Venice, where she has never been. (One of the virtues of the movie is that Rosalba makes a seemingly arbitrary choice, and just runs with it; we do too, happy to go along for the ride.) The bulk of the tale is Rosalba playing hooky from the dreariness of her life—her pot-smoking younger son, her apoplectic husband and his mistress—and constructing a new one for herself. What's especially nice about Bread & Tulips is that this isn't the Venice of museums and canals teeming with tourists, but a genuine town, with noisy neighbors and dirty dishes in the sink. It's not a Disneyland destination, but a living city, in which some of the buildings just happen to be by the likes of Palladio. Rosalba befriends the maitre d' at the restaurant she frequents; his name is Signor Fernando, and he's played in lovely, understated fashion by Bruno Ganz, probably most familiar to U.S. audiences from Wings of Desire. He's an Icelandic immigrant leading a monastic life, though he shows kindness to Rosalba, the stranger in a strange town with a sweet smile, and gives her a place to stay when her pension goes out of business. She meets the variety of eccentrics we've come to expect in such a story, including the anarchist florist for whom she goes to work, and the holistic beautician and masseuse in the apartment next door. This is the kind of material that could seem cloying and artificial in other hands, and it doesn't forge any new cinematic ground; but the filmmakers' touch is a light and deft one, and these characters are fine company for a good two hours or so. Especially fun is Giuseppe Battiston as Costantino, a plumber who loves to read detective novels; thinking that hiring an actual detective would be too expensive, Rosalba's husband dispatches Costantino instead, and he soon plasters Venice with WANTED posters bearing Rosalba's face. (Catania is wonderful, too, and a bit reminiscent of the Christopher McDonald character in Thelma and Louise.) The movie is content to hop from character to character, as the biggest changes for the people here are interior ones; it's a movie that's also happy to take time out to let Rosalba play a couple of songs on the accordion, to no particular end. I found this all rather winning and charming, but if you're impatient for story and more story, you're probably looking in the wrong place. Maglietta ropes the whole movie together in a fine, understated performance—the script doesn't force her to articulate the ennui and dissatisfaction of being the housewife for a family of slobs, nor do her decisions seem forced or arbitrary. In some respects the story bears a resemblance to Shirley Valentine, but happily, Bread & Tulips is without any overbearing explanatory narration, and neither Maglietta nor the picture wear out their welcome. Image Transfer Review: Any movie shooting in Venice is already a leg up: wherever it's pointed, as long as the camera is focused, you're more than likely to photograph something spectacular. Color levels are generally quite good, though the blacks could be a little sharper; every now and again, in a night scene, a character will be lost in the darkness. Audio Transfer Review: The soundtrack displays excellent and clear dynamics, and the balance between dialogue and music is generally well struck. The movie seems to have been foleyed to death, though, and every footstep on each cobblestone, each chair being pulled back from a table are inordinately loud, sometimes to the point of cacophony. 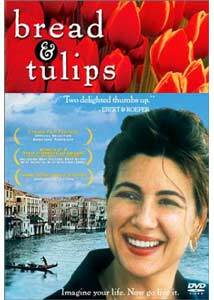 Bread & Tulips is a sweet movie telling us to take time to smell the flowers, to wake up and smell the cappuccino, if you will. It's not terribly trailblazing, but its sweet mixture of good-hearted humor and old-fashioned slapstick is likely to bring you more than a few smiles, and besides, it's two hours of Venezia—bellisima!